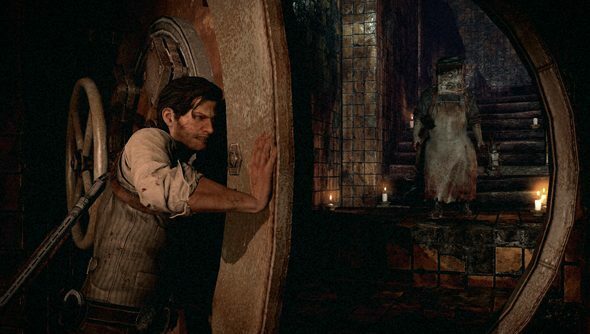 The Evil Within is, first and foremost, a twisted imaginarium filled with things nobody should have thought of. That leaves its set of well-established US voice actors with an intriguing challenge. They’re left pretending to be “covered in acid” or suffering from “itchy brain”. But they seem to enjoy it. The Evil Within protagonist Sebastian Castellanos is played by Hell on Wheels’ Anson Mount; its primary friendly face by Dexter Morgan’s former sister Jennifer Carpenter; and its villain by Watchmen Rorschach’s Jackie Earle Haley. They’re all here, in this video. What’s odd to see is that the voice and appearance of American actors has been merged with the performance-captured movements of entirely different actors in Japan. One imagines the same is true to a certain extent in other third-person games: contemporary Sam Fisher Eric Johnson lends his own guarded gait to Splinter Cell: Blacklist’s protagonist, for instance, but his split-leg gymnastics are somebody else’s. All that complication will presumably come out in wash – though in The Evil Within’s case, ‘the wash’ probably entails a Victorian wringer. It’s that sort of game. Are you into it?